Since we last discussed the Surface Navy’s operational concept of Distributed Lethality (DL) in July 2015, there has been a tremendous amount of progress on the topic. 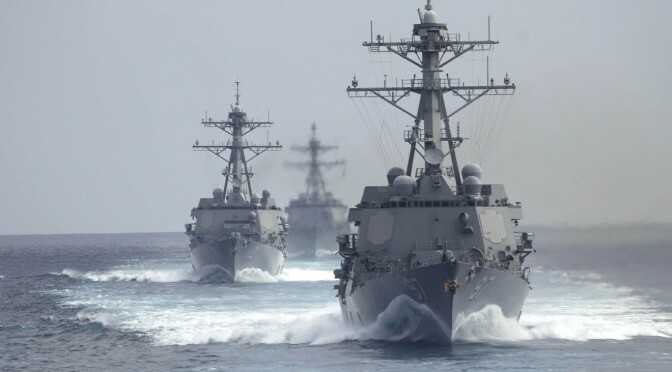 Distributed Lethality is the condition gained by increasing the offensive power and defensive hardening of individual warships and then employing them not only in traditional roles, but also in different ways than has been the practice in the past few decades. Distributed Lethality enables Naval Surface Forces to provide forward, visible and ready combat power for the nation. Operating forward, Naval Surface Warships execute military diplomacy across a wide geography, building greater transparency, reducing the risk of miscalculation or conflict, and promoting a shared maritime environment. Maintaining a persistent visible presence, Naval Surface Warships assure allies and partners and promote stability by deterring actions against U.S. interests. Providing credible combat power, Naval Surface Warships are ready to respond when called upon in times of crisis providing operational commanders’ options to control increased ocean areas and hold potential adversaries at risk, at range, whether at sea or ashore. There has been a significant investment in thinking about the problem throughout the past year. More recently, the approach to understanding the concept has been largely twofold: first, we’ve worked to understand what value DL could bring to the Surface Force and a step further, to the larger Fleet. We’ve approached this through three primary lines of effort: wargaming, analytics and operational experimentation. Studying the results of more than 15 wargames in 2015 alone, substantial analytics from multiple sources and operational experimentation deepened our understanding of the value that a distributed and more lethal Naval Surface Force can provide across a number of scenarios and ranges of conflict. We are training now for our first Adaptive Force Package deployment this Spring. During the final week of February, CIMSEC will host a series focused on the next chapter of Distributed Lethality. The theme of the next chapter gravitates around the question of “how we fight” as a more lethal and distributed force. As such, we’ve listed some of the key issues that we seek to better understand. For example: How should the upcoming Adaptive Force Package be employed: including Tactical Situation (TACSIT) execution, organic and inorganic targeting, fielding of modified weapons, and improved integration with Amphibious Forces and Expeditionary Marine Corps units in support of sea control operations? What role does Distributed Lethality play in other joint concepts such as the DOD Joint Operational Access Concept (JOAC)? How will the utilization and fielding of the F-35 (Navy and Marine Corps variants) contribute to the effectiveness of Distributed Lethality? What effect will cyber warfare have on the surface forces in the context of Distributed Lethality, both offensively and defensively? How can we better utilize the signature spectrum in a complex Anti-Access/Area Denial environment? How will the addition of a long range surface-to-surface missile affect both the deterrent and warfighting ability of the Surface Navy in the various phases of conflict? What are the legal implications of arming MSC ships, both for self-defense and for a more robust offensive role? How and to what extent should the Surface Navy incorporate other nations into Distributed Lethality? What are the risks of Distributed Lethality across the various phases of conflict? Contributions can focus on the aforementioned key issues, or can explore Distributed Lethality in a broader strategic and operational context. Submissions should be between 800 and 1800 words in length (with flexibility) and submitted no later than February 21 to the CIMSEC editorial team at Nextwar@cimsec.org. Editors Note: This topic week has since concluded and writings submitted in response to this call for articles may be viewed here. Ryan Kelly is a Surface Warfare Officer in the United States Navy currently assigned to Commander, Naval Surface Forces Distributed Lethality Task Force.